Knowledge Based Economy, employees are commonly seen as a crucial competitive and innovative factor of company sources. However, achieving positive results from HR is possible only with adequate managerial practices and tools. The theory of HRM is constantly verified and updated by its practical application in enterprises. This handbook tries to combine theoretical and practical aspects of HRM. Whether it is successful let the reader assess. Union. This historical view - in author's opinion - is a very important to understand the nature of Human Resources Management in Poland. 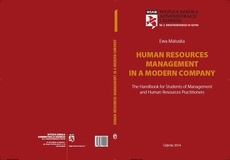 The handbook is addressed to those students of Management courses who can't approach the rich Polish language literature on HRM directly; especially foreign students, coming to Poland on Erasmus students' exchange program, but also to foreign practitioners engaged with companies operating in Poland. Each of eight chapters of the book has its summary with main issues discussed in the unit. Additional explanation to currently discussed issues are presented in tables enclosed in the text. Selected practical HRM tools are attached in appendixes on the end of the book.